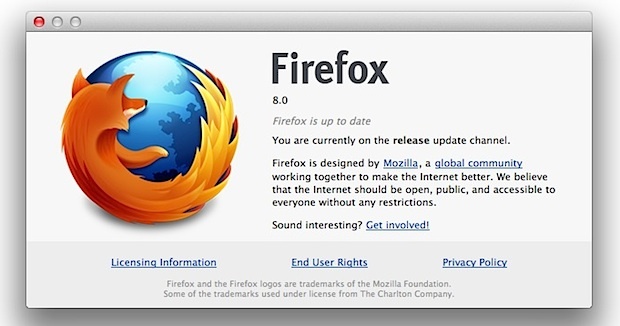 In the never-ending quest to make version numbers irrelevant, Firefox 8 has been released. Technically it’s not supposed to be out until tomorrow, but as with past Firefox releases, the download was pushed early to the Mozilla public FTP servers and is widely available for anyone to pick up for each supported platform (Mac, Windows, Linux). Features of Firefox 8 include Twitter search integration, improved HTML5 support, better extension/plugin security, and some tab improvements that I couldn’t identify. When you first launch Firefox 8 you’ll encounter the new add-on manager, which checks to make sure you installed the add-ons and not a third party. You’ll also notice that the default Firefox page seems to think it’s a beta version, but when you check the version number it’s 8.0. Firefox 8 feels a bit faster too, particularly when loading from cache. Mac OS X Lion users may be disappointed to discover that true Full Screen support is still absent in this release. You can enter into their own baked version of full screen mode with Command+Shift+F, but there is no full screen button in the upper right corner until you’re already in, and the overall approach Firefox takes feels sloppy compared to Safari, Chrome, or any other OS X Lion apps handling of full screen mode. This leaves Firefox as the only remaining popular Mac browser that hasn’t adopted full Lion feature support, but I’m sure it’ll come eventually. I always update to the latest but I don’t see many differences in this one. The current versioning system is meaningless though, this is a point release at best. The only thing I notice with these ‘big’ little releases is they screw up half my extensions. I don’t understand. Happy viruses then. Firefox 5 has known security vulnerabilities and is no longer supported (for a couple of months atm!). And maybe sometime, we will have native PDF embeded preview in Firefox. In the meantime, Firefox is unusable on Mac OS X.
I wouldn’t call it “unusable”. I use Firefox for some websites that don’t work well in Safari. Just because it doesn’t do one thing you want it to do, that doesn’t make it “unusable”. I certainly would call Firefox unusable on Mac OS X. In my opinion it’s without doubt the worst browser available for Mac OS X.
I wrote this reply on another website which mentions the release of Firefox 8. That website also was talking about Firefox lacking Lion-specific features, like full screen support. This is the reply I wrote on that website. Did you expect anything else? In my opinion Firefox is by far the worst browser for Mac OS X.
It’s completely obvious Windows is the platform Firefox is developed for, while other platforms just get a lousy port without any specific features for that platform. On Mac OS X the X to close a tab or window is always on the left side. Firefox refuses to put those buttons on the left side of the tabs. On Windows they’re on the right side and since they don’t care about other platforms, the buttons are on the right side on all platforms. Google Chrome does the same, while Opera does it right and puts these buttons on the left side of the tabs. Firefox just uses the Windows translations, instead of the Mac translations. I’m Dutch and on the Mac “file” is translated as “archief”, while it’s translated as “bestand” on Windows. Next to “file” is “edit”, which is translated as “wijzig” on Mac OS X and as “bewerken” on Windows. So, Mac OS X and Windows use different translations. As you’d expect, Firefox uses the Windows translation, instead of the proper translation for Mac OS X. So, they release a browser for Mac OS X, but don’t even care about the proper translations. Google Chrome and Opera use correct translations. On Mac OS X it’s very easy to change the language of the operating system, so all available language are included in the application. This way the language of all applications change when you change the language of the operating system. Just change the language of Mac OS X from Dutch to German and the language of the applications are also changed to German. On Windows you just buy one version of the operating system. When you buy a PC in the Netherlands and want to run your operating system in German, you’ll have to buy the German version if Windows (although it’s possible to download and install MUI-packages, but as far as I know only on the Ultimate versions of the operating system, which is useless, because all PC’s are pre-installed with Home Premium). Because of this it’s pretty useless to put all available languages in one package, so Firefox has a seperate package for every language. Of course this is not the way an application for Mac OS X should be distributed. All languages should be included in one package. Google Chrome and Opera do this the right way. Apple has released the Mac App Store 10 months ago. This is the place to download applications for the Mac. Not only paid applications, but also free applications. Every application should be available here, so users shouldn’t have to search for their applications on the unsafe internet filled with scam pages. Of course Firefox isn’t available in the Mac App Store. Opera is available in the Mac App Store, but Google Chrome is also missing (just like commonly used applications like Microsoft Messenger and Skype). Am I surprised Firefox still lacks integration with Mac- specifix features? No, not at all. It’s exactly what I expected from Firefox. In my opinion there’s nothing wrong with Safari, but of the third party browsers Opera is in my opinion the best browser. Opera just does everything right. It’s not a lousy clone of the Windows version, but it’s completely designed for Mac OS X. Opera doesn’t work the way it works on Windows, but everything works the way it should work on Mac OS X. Only problem with Opera: It’s an underdog, so it’s being ignored by web developers, which causes some websites to not work. For example: The “Look Inside” feature of Amazon always gave a message Opera wasn’t supported, although it now seems to work (although the book previews just open in a new page, instead of in an overlay). Google Chrome is also a very good browser. Firefox is just complete crap on Mac OS X. So that’s the reply I wrote on that website and I forgot to mention the button to go a page back. That big arrow to the left and the smaller arrow to the right is the Windows way. It’s the design of the Windows Explorer and Internet Explorer. It looks completely ridiculous on Mac OS X. To change the look of those arrows, you can change from “big icons” to “small icons”, but even when you choose “big icons” all icons should be of the same size, as that’s the way it is on Mac OS X.
I also forgot to mention embedding of PDF files. Good point. You’re absolutely right about that. So, in my opinion you’re absolutely right about Firefox being unusable on Mac OS X. It’s absolutely a terrible browser. I can’t believe those people saying Firefox is the best browser ever. I use PDF Browser plugin for mac, it’s not bad. So, do the developers of Firefox think they’re too good to support Lion’s native full screen ability? Google updated Chrome to do so really quickly. What’s up with Firefox? I got an HTTP 550 Permission Denied error while trying to download the new update. I also tried downloading the updated Firefox version and had a few problems with error messages which I overcame. Personally though I prefer it to Chrome even though from people’s comments it provokes a fair amount of healthy debate!